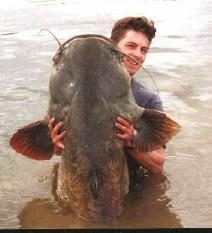 Do photographs show fisherman with giant catfish caught by 'noodling'? Status: Real photographs; inaccurate description. 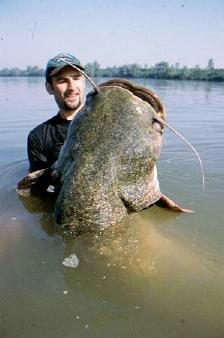 about these monsters the next time you order a catfish dinner! 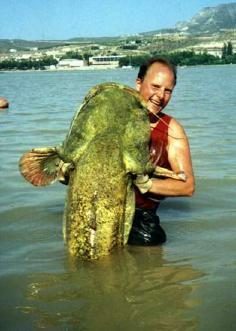 Although handfishing is perfectly legal in some states, others have passed or retained laws against it, due to the dangers of noodlers’ accidentally pulling up something harmful (like such as disgruntled snakes or snapping turtles) and because the hobby can threaten aquatic populations if handfishers remove too many sexually mature fish from their underwater nests. 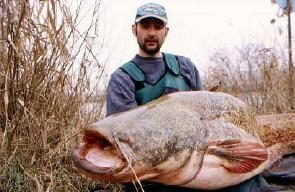 Nonetheless, in 2005 Missouri agreed to allow handfishing on an experimental basis, joining 11 other states in which handfishing is now lawful. 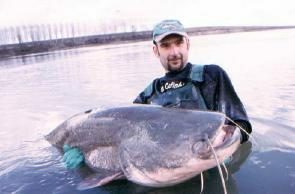 were assembled from a variety of foreign angling resources, such as the albums at the Italian Carp Fishing web site, and the French Silurus Glanis (catfish angling) site. Associated Press 28 December 2004. The Tennessean. 4 June 1999. National Geographic News. 15 May 2003.